· Made with glove-soft, genuine leather seating surfaces for luxurious comfort or with SaddleHyde for water-resistance and durability. The heavy duty 3/4" CNC finished sissy bar provides durability for your passenger, while the sissy pad adds extra comfort. 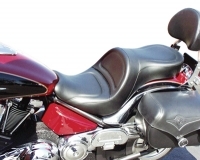 The Sissy Bar Kit includes mounting hardware, sissy bar, sissy bar mounts, and sissy pad. For added style, the Sissy Bar System is compatible with Show Chrome Accessories® Saddlebag Stays. Available in plain or studded.